The LOFT payload module will host two instruments: the Large Area Detector (LAD) and the Wide Field Monitor (WFM). The LAD will improve upon the effective area of the largest area X-ray instrument ever flown (the Rossi X-ray Timing Explorer's Proportional Counter Array) by a factor of about 20. The improved energy resolution (better than 260 eV) of the LAD will allow the exploitation of spectral diagnostics of relativistically-broadened 6-7 keV (Fe-K) lines, in particular. 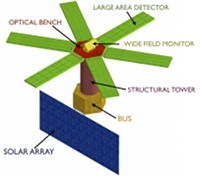 It will be deployed through a mechanism based on that used for Synthetic Aperture Radar missions, such as the Soil Moisture and Ocean Salinity (SMOS) mission, where very large panels are deployed in space with high accuracy. The Wide Field Monitor (WFM) will discover and localise X-ray transients and impulsive events and monitor spectral state changes with unprecedented sensitivity. Targeted follow-up observations will make this resource important in its own right. (Left) A single WFM coded mask module, and (right) an arrangement of several units to cover 3 steradians. Credit: LOFT proposal team. The LOFT LAD must cover a geometric area of ~20 m² yet have a reasonably low weight. Large-area Silicon Drift Detectors (SDDs) designed on the heritage of the ALICE experiment at CERN/LHC, and a collimator based on lead-glass microcapillary plates (the mechanical structure of the well-known microchannel plate) would be suitable for a sensitive but light-weight experiment. The detector drift concept makes the spectroscopic performance of the SDDs weakly dependent on the extent of the collecting surface: large-area (~70 cm²) monolithic detectors can be designed, with only 256 read-out anodes (thus low power requirements, ~60 W/m²) but very good spectral performance (FWHM ~260 eV). An unprecedentedly large throughput (~3 x 105 counts per second from the Crab) is achieved with a segmented detector, reducing the impact of pile-up and dead-time, which often limit traditionally focused telescopes.